Новая попытка от HTC. Компания хочет доказать, что ещё может конкурировать с Apple, Samsung и LG. Получилось? Да, но что по ценам? Hello friends! Today we have a review on the new flagship HTC, and the company's first smartphone this year. Despite the Google bargain, the company not in a hurry to release the only Pixel, they make own smartphones — U12+ confirmation of that. And you know, over the last couple of years – it's getting better and better. Of course with great reservations. This is U12 +, the usual version of U12 we have not yet seen and it is not clear whether we will see at all. Here with the names of the devices the Taiwanese have straightforward problems. Plus HTC loves new technologies, as usual here the company realized a lot of new features, it's a sin not to look at it. Let's start with the appearance and configuration. Three color options — red, black and transparent blue. Transparent HTC we have already seen – U11 Plus, and it gained a special popularity, allowing you to look "under the hood" of the device. Well, it looks really unusual and "geekly". The frame is metal, in front and behind the glass. The glass surface is especially popular recently not only because of the possibility of introducing wireless charging, but also because you can add any pretty patterns. Uniqueness in every note! This we also saw this… recently presented by Huawei Honor 10, for example. But HTC has another feature — the color is poured and distorted at the corners, in the red version, or as already mentioned – a transparent case. 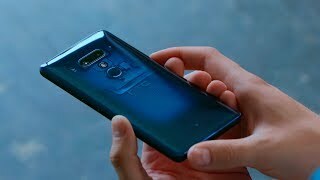 But in any case – U12+ is similar to the LG V30, especially behind. Plus, the glass ideally collects prints, stronger than the same iPhone X. And what is this glass – it is not known. HTC does not talk about this, although in U11 there was a Gorilla Glass of the 5th generation. Apparently, here are the last generations.. They do not tell us. To somehow protect the body from dirt and scratches, The company put a plastic transparent case with open verges into the kit. This is done for a reason, because the Edge Sense technology has not gone away, moreover, it has been updated to version 2.0. If suddenly missed — it is (to someone) a convenient opportunity to control by one hand. Compressed verges, of course, everything is adjusted. The functions are added, now you can also double pressing, two types of compression: long and short, For example, the short compression opens the camera. Or, here is a smart orientation, this is when you lie down, turn the phone, squeeze it, and the screen does not turns. But I have a question – does anyone really use this? Because it is inconvenient, I also have got Pixel 2, there are these compressible verges (made by HTC) – I never used them! On the other hand, it is difficult to scold HTC, because if you do not like it – turn off, that's it. There are questions on the other part. You see these buttons? Two volume controls, one ribbed power button, They're not buttons in the classic sense – they are sensors. If you know what a new button in iPhones 7, 8 and what is the Taptic Engine – that's about the same thing..
Sensations are pleasant, but there are two problems. First, you need to push hard enough, it will be quite difficult for girls. Secondly, the buttons can not work together, which means that I can not make a screenshot, for this I need to put my fingers in the "pressed verges". And it's very strange, it would be better to set up and adjust the pressure, or simply put the usual keys. Further. On the left is a hybrid slot — two SIM cards or one SIM and a MicroSD. At the top is a microphone, below is a microphone, a speaker and a Type-C. The case, by the way, is protected by the standard IP68, which is very good. Behind the camera, flash, microphone and fingerprint scanner. Fast, but not particularly necessary. There are two cameras in front, a microphone and, attention, a fourth microphone! But nothing surprising, in U11+ was the same, and for communication – U12 + remains the best for today..
U12 + is equipped with a 6-inch display with a ratio of 18 to 9 and a resolution of 2880 at 1440 points. The pixel density is 537 ppi. Super LCD 6 technology, support for HDR10 and advanced color profile DCI-P3..
All this is configured in the parameters. The screen is just super, but there is not enough brightness, especially in the street. Viewing angles are excellent. But, despite the fact that this is IPS – there is an Always-On mode and it is flexibly configured..
With such a large screen, the size of the battery is rather modest, as well as in the flagships of Samsung — 3500 mAh, there is support for quick charging Quick Charge 3.0. Suffices for 5-6 hours of the screen, the result is similar to Pixel 2 XL, nothing supernatural. Cameras. Not three, but two. Behind. Dual optical zoom, optical stabilization, bokeh effect — automatic and customizable. Both main cameras are equipped with proprietary Ultrapixel technology. In the basic 12-megapixel module this is 1.4 microns, in the second 16-megapixel telephoto lens is 1 micron.. In this case, the aperture of the first f / 1.75, and the second f / 2.6. The focus is instantaneous, a hybrid of phase and laser autofocus is used. And in general – the camera application is done perfectly, I'm praising. Specialists DxOMark estimated the camera HTC U12+ in 103 points — only six points less than the leader,. Huawei P20 Pro. Among them, 106 points for photo opportunities and 95 points for video. A good start for HTC, considering that the video is not the best, but the photos are really very good. Appreciate the day's shooting, now the backlight, the night is not at all Huawei, but also not bad,. Well, a portrait – that's up to you to decide. Here's to compare the same thing on the iPhone X. There are bonuses for fans to shoot video on a smartphone. First, the record in 4K 60 fps..
Secondly, the function of cinematic smooth zoom, You wipe it off while taking pictures to the left and gradually image comes closer to the specified place. Plus there is a function to record sound only where there is zoom, four microphones allow you to do this. By the way, we saw the same in the LG V30, and here it really works. Slow-Mo U12 can write 240 frames at 1080p. They did not implement 960 fps. Or they could not. In addition, if you want to learn how to shoot normally, HTC gives a DVD with video lessons ... oh well, I'm joking. Gotcha? Front-camera. Two! Why there are two of them? First of all, to do a selfie with a background blur, Although, the Pixel with one camera still works better. Perhaps the software will be improved – we will check it. The camera has 8 megapixels, an aperture of f / 2.0, a pixel size of 1.12 microns.. But, the second function. Face Unlock – this justifies the presence of two cameras. Because it works very quickly. So you can forget about the fingerprint. HTC has always pleased us with quality headphones in the kit and excellent sound. This is not lost this time too. The USonic “plugs”. The automatic calibration function will set the sound to your ears. It works like this: insert headphones, turn on the program, and it depends on the auricle adjusts the equalizer so that you get a full buzz from the sound..
Of course, this is not "ears" for $ 1000, but if you properly take a sip of beer, you can immerse yourself in the world of "dip-disco" and enter into a trance. And yes, of course! Let me remind you that there is no mini-jack here. The company switched to Type-C, but was able to maintain the level of sound quality. And even the adapter was not put in the kit, amazing... Well, for those who have long forgotten that such a wired headphone, the flagship has equipped Bluetooth 5.0 with AptX HD protocol support, providing transmission via Bluetooth in Hi-Res audio format. With this, everything is OK, but as in Galaxy, two audio devices can not be connected at once. The external speakers are loud too. Here, of course, you can find fault with the sound, since many devices have a similar sound, but there is a stereo and a pretty clean sound, perfect for Youtube. Hardware. The flagship chip Snapdragon 845, 6 GB of RAM, 64 GB or 128 GB of internal memory. In the tests we get crazy figures, 250 thousand points in AnTuTu! The games work fine, and it seems like there is almost no trotting and the smartphone is not warming up. But how the phone works is... just a fairy tale. Inside Android 8.0 with the proprietary image HTC Sense. There will be an update to Android P, soon. And they do not just promise, but they say that everything is ready, only small details remain. We'll see. In terms of speed, it's like OnePlus 6 and Pixel 2, ie. the gain compared to U11+ is very noticeable. What do I mean by this? It's too early to bury HTC in the ground. It is evident that the company tries, listens to its customers and corrects mistakes. U12+ is much better than U11+, although device lost a few mAh in its battery, this sacrifice brought many new features to the device.. But here's the price, of course, beyond the limit – $ 800. Can you imagine how much it will cost in Russia? In a good case, 50 thousand rubles, but it seems to me that the figures come close to 60 thousand rubles. And for this money, I would not have bought myself, when the market has a bunch of other interesting smartphones. And... touch buttons are not the best idea! In all other respects, the flagship really appealed to me. It's interesting that Google will take it to its Pixel 3..